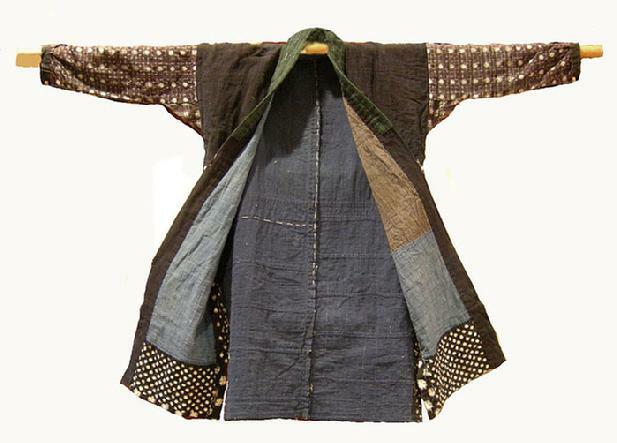 Very Nice Antique Japanese Hand-sewn Kasuri Patched Cotton KImono Jacket - Late Meiji /Taisho - (1900-1925) - the indigo cotton Kasuri (ikat) Farmer's jacket, sewn together with five different Kasuri motifs, mixed with solid indigo cotton, lined in a wonderful color and texture of indigo and striped cotton that have been Sashiko stitched (running stitch) with indigo thread in a striking square design. 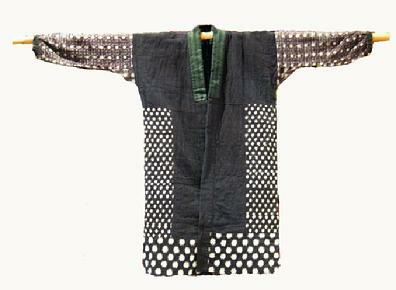 The narrow sleeves with brass fasteners on both cuffs, green lapel. Condition: Very good. 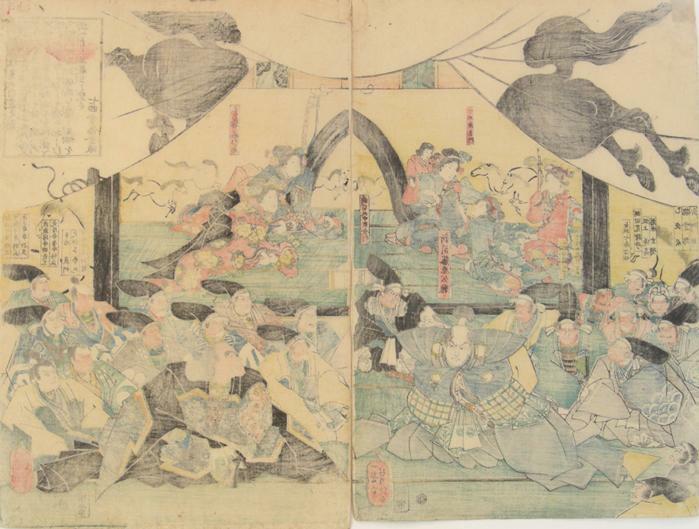 Size Flat: Approx 52" x 20" x 36.5"
Original Japanese Woodblock Print - Oban Tate-e Diptych - Yoshitsuya Koko - 1843 - Daimyo gathering at the Imperial palace in the Edo Period. The Lords in the foreground are seated on a lower dias, with the 'beauties' seated on a high riser behind. 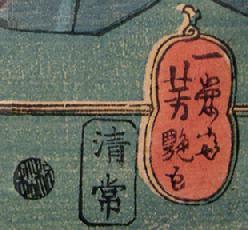 Signed Ichieisai Yoshitsuya ga in a red tashidama cartouche; censor’s seal: Muramatsu genroku. Condition: Very Good Overall; fine original color, not faded; excellent bleedthrough; very tiny pinpoint holes at upper corners from pinning up, (not noticeable); a small bit tape at top corners; two separate panels, not backed, not attached; some very light soil as would be commensurate with age. Size: 19 1/2 in. x 15 in. 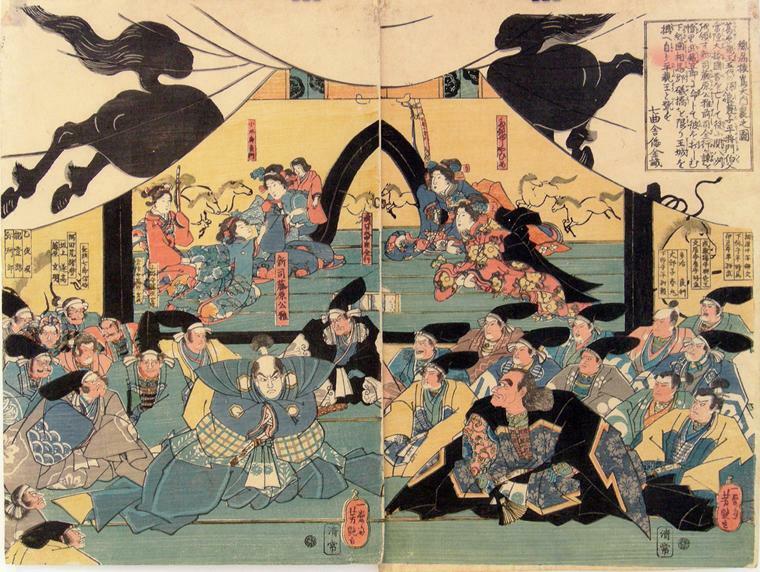 Original Japanese Woodblock Print - Oban Tate-e Yakusha-e (Actor) Triptych - Chikashige Morikawa - April 14, 1880 - The left panel is the actor Ichikawa Danjuro - 'gauffrage' (blind printing in the hair) and 'bokashi' (shading on the face). The other panels are not identified. 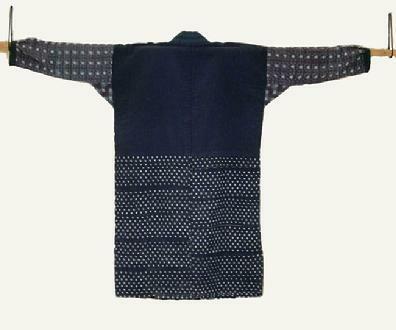 Signed : Ichikawa Chikashige hitsu with a red toshidama seal; Carver: Hori Ko Chojiro. Condition: Very Good Overall; fine original color, not faded; excellent bleedthrough; two panels joined with tape, one separate panel, a little light soil, as would be commensurate with age. Size: Approx. 28 in. x 14 in. 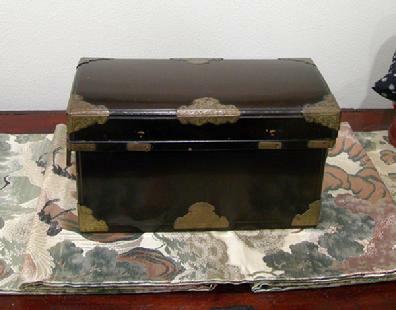 Antique Japanese Lacquered Nagamochi (Dowry Trunk) - The lacquered box with slightly domed lid and engraved brass fittings and carry handles; the interior lined with paper. 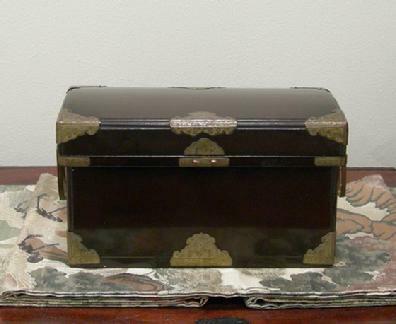 The back top hinges are missing, part of the front lock is missing, the handles are slightly bent, and the lacquer has some small chips. Condition Overall: Good as would be commensurate with age and use; the back top hinges are missing, part of the front lock is missing, the handles are slightly bent, and the lacquer has some small chips. It presents very well.